Del's debut album, ''I Wish My Brother George Was Here,'' has been heralded as a benchmark for underground hip-hop, bolstered by P-Funk inspired beats produced by Ice Cube, (Del's cousin) and featuring the classic ''Dr. Bombay'' and ''Mistadobalina.'' (#9 on the 1992 Hot Rap Tracks chart.) Equal parts clever, thought-provoking, and goofy, I Wish My Brother George Was Here has been credited with injecting some humor and irreverence into the otherwise dour West Coast hip-hop culture of the 90s. Now that the Elektra original has been out of print for a while, it's a relief to see this back in print! Extended package includes a fold-out poster of the original LP cover artwork. Produced by Del, Boogiemen, Ice Cube and DJ Pooh. Like many hip-hop masterpieces, I too slept on this far too long. Del's collaboration with Dan The Automator and Kid Koala, "Deltron 3030", was one of my favorite rap albums in the past 10 years. If I hadn't discovered that masterpiece, I would have never discovered "I Wish My Brother George Was Here". The stark contrast between the two records is phenomenal, which merits the critical acclaim both albums received. Del may be the cousin to hip-hop pioneer Ice Cube (executive producer), but the two are quite dissimilar. Ice Cube helped to popularize (not invent) west coast gangsta rap, while Del was laying the groundwork for California's up-and-coming underground rap scene. Besides, Del was right along side of Ice Cube in the studio tweaking it to perfection. This debut is undoubtedly derived from the Parliament-Funkadelic production popularized by NWA, but was spun in exciting new directions. Del can be silly, humorous, boisterous and messy, without falling prey to the violent, and rigid workings of NWA. Del's view of city life is more laid back and observatory than that of NWA. He speaks out against the city bus system on "The Wacky World of Rapid Transit" in a humorous, but earnest way - "When oh when is the bus gonna come / Well here comes a pack of about 14 / Lookin' real mean with hoodies and jeans / And bad attitudes and I wasn't in the mood / For no head on collision with the hoods / Try to use my transfer but it's no good". "Mistadobalina" is also one of my favorites. But the one that sank it's hook into me first was "Pi**in' on Your Steps", produced by Boogiemen. I like this lyric quite a bit - "Ice is cool, but I can't stand Vanilla / because he takes a style and tries to mock it / ain't nothin' personal, G / but I'm kinda inta chocolate / it's all about the black / and it's like that / and I'm so laid back cause I smoked a phat sack". Up next is "Dark Skin Girls", which has a chorus that will definitely catch your attention (and may ruffle a few feathers) - "Dark skin girls are better than light skin, light skin girls ain't better than dark skin". Now, I think it's very clear that this is Del's preference. Especially when you consider Ice Cube's commentary in the background (disagreeing with Del), and this lyric - "this don't apply to all the girls with light skin / just the ones with their heads up their rear end". Whatever. I'm white and I "prefer" white women; nobody should be surprised if a black man prefers a black woman (apparently some are). A couple of other outstanding cuts would be "Dr. Bombay" and "Sleepin' on My Couch". The latter features some funny but very true thoughts and feelings of your "friend" crashing on your couch night after night - "Maybe this was just my upbringing perhaps / but I was taught that I shouldn't take seven day naps / at other brothas' cribs like I don't have a home / brothas' on my couch so much there's like foam / coming out the seams, and a pair of jeans is missing from my closet". 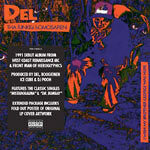 Del brings a lot to the table for his seminal debut. Everybody calls it a classic for a reason. Because it's solid, original and unique. Del isn't your average high-strung emcee to come out of the golden age of west coast hip-hop. He comes of as smooth, laid back, and intelligent. Del's vivacious personality makes this one a keeper.